From inception, our founder recognized that there was a collective niche in the industry for a company to supply tube contour inspection fixtures and meet the demand for specialized design and prototype projects for Tier 1 automotive tubing suppliers. With this vision and specialized need, FormFab has positioned itself as a leader in the industry when it comes to craftsmanship and the ability to exceed customer expectations for those Tier 1 and additional OEM suppliers. As our growth strategy presented further opportunities, FormFab has expanded to include short run production led by a multi-faceted team of experienced tube fabrication professionals. 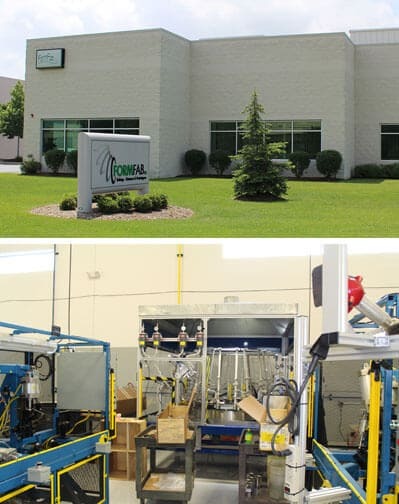 Headquartered in Rochester Hills, Michigan, FormFab has a 16,000 square foot facility that houses our tooling and gauge/fixture build and design operations. Adjacent to the tooling operation is a 25,000 square foot state of the art facility dedicated to prototype development, low volume production, support, and headquarters. The FormFab formula for success includes constant innovation, precise work flow processes and a commitment to quality as evidenced by our ISO/TS 16949:2009 Certification. Manufacturer of precision bent metal and nylon tubing assemblies & inspection fixtures for the tubing industry. Focusing on the prototype needs of our Tier 1 automotive customers. QMS certified to ISO/TS 16949:2009 with Six Sigma Black Belts and Green Belts on staff. 16,000 sq. ft. tooling/gauge fabrication facility and 25,000 sq. ft. production and head offices located in Rochester Hills, Michigan. Equipment capacities-Fabricating, bending/forming and end forming of up to 1-1/2 in. diameter of various metal tubing and Multilayer nylon tubing. CMM certified & traceable to NIST standards. FormFab, just wanted to send a note to thank you for the quick turnaround on the prototypes. Our customer was working on cars until 2:00am this morning and was able to equip cars for the SEMA show with the assembly you provided. Thanks again to all of you and your crew for your support, I cannot stress enough how great of a partner FormFab is for us. THANK YOU!!! I want to thank you guys for coming through. I know you guys are professionals, and you have shown it. Let's keep in contact to ensure we stay on top. Thanks again for you efforts. Guys, again thank you to the FormFab staff for their hard work and excellent support of Ford's design issue over this past weekend.